The Otto Bremer Trust supported Summit Academy OIC’s capital campaign with a program-related investment of $300,000. The investment will help the academy better support students on the path to self-reliance by ensuring an optimal learning environment, safeguarding the structural integrity of its facility, and supporting the growth of new programs. “I tell my kids I build houses,” says Tamir Raheem. 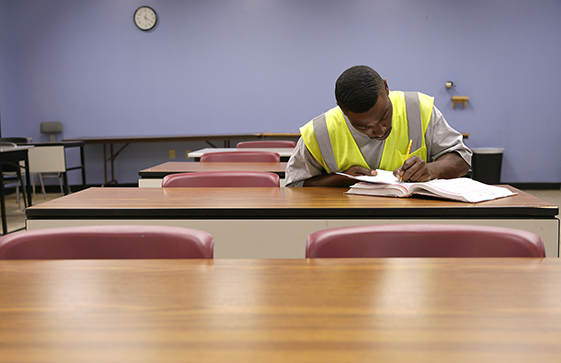 “I make homes for families.” At 33, Tamir just earned his GED at Summit Academy and is a few weeks away from finishing the construction training program. Today, he is leading a team of students who are building a small house in the school’s construction yard. 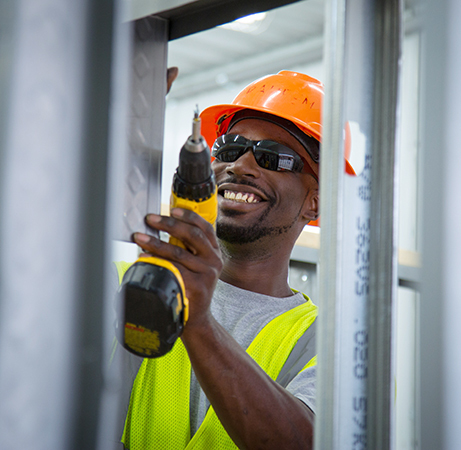 Outfitted in an orange hard hat and safety glasses, Tamir crouches down with a power drill to install a metal stud. Tamir has five boys back in Spokane. He moved to Minneapolis to reconnect with his dad and make a fresh start. It’s hard for him to be away from his family, but he’s confident he’ll come out of Summit Academy with a bright future. The construction yard is filled with the sounds of sawing and drilling as students get hands-on training. Each week, it’s something different: metal studs and sheetrock, floors and walls, wood framing, tile layout, roofing, concrete formwork. In the adjacent wood shop, where sawdust hangs in the air and coats the floor, students focus on finish work. Tamir Raheem’s humility and dedication show as he talks about his kids and his ultimate goals. Six months ago, Tamir was sitting on his couch after work, watching TV, when he saw a commercial for Summit Academy. He picked up the phone. A week later, he attended an information session. A week after that, he enrolled in the program. (Bottom) Tamir studies in an empty classroom for an upcoming final exam during his lunch hour. 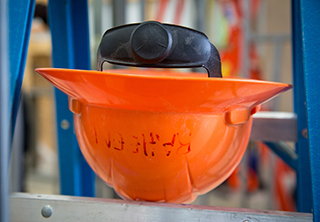 Tamir’s hardhat rests on a rung of a ladder in the construction yard (top left). Tamir, right, works with his fellow students on their team’s structure. Only yesterday did Tamir’s team start drawing up plans for the house. By the end of the week, they will have installed a ceiling and a window and hung drywall. Later, the whole thing will be torn down because, as their teacher explains, the students learn as much from demolition as from construction. 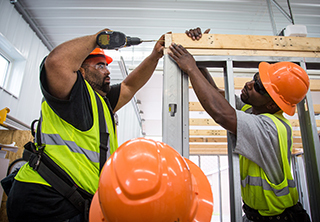 After Tamir finishes the program, he plans to join the Carpenters Union and find a job. Summit Academy will have given him all the training he needs. With support from the Otto Bremer Trust, Summit Academy OIC helps people like Tamir find stability while completing short-term, no-cost, accredited education and job training programs. The Programs give students opportunities to earn a GED and gain the skills they need to establish careers with living wages. Noor Edward used to be afraid of the dentist. Now she dreams of becoming a dental assistant. At 33, Tamir just earned his GED at Summit Academy and is a few weeks away from finishing the construction training program.